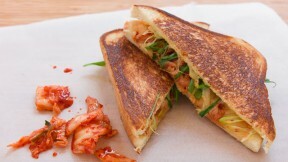 Combine crunchy fermented Korean vegetables with nutty, melted comté for a delicious sandwich. Use a pastry brush to evenly brush the olive oil onto one side of both slices of bread, making sure to get the edges around the crust as well. Flip one slice of bread over (to expose the un-oiled side) and then spread half the cheese on the bread. Top with the squeezed kimchi and scallion, and then cover with the remaining cheese. Place the other piece of bread on top to make a sandwich, with the oiled side facing outwards. Put the sandwich in a heavy bottomed frying pan and then stick another very heavy frying pan (like a cast iron skillet) on top to press the sandwich down. Turn on the stove to medium, and let the sandwich fry until the bottom is golden brown and crisp. Remove the weight, flip the sandwich over and then put the weight back on. Fry until the second side is golden brown.